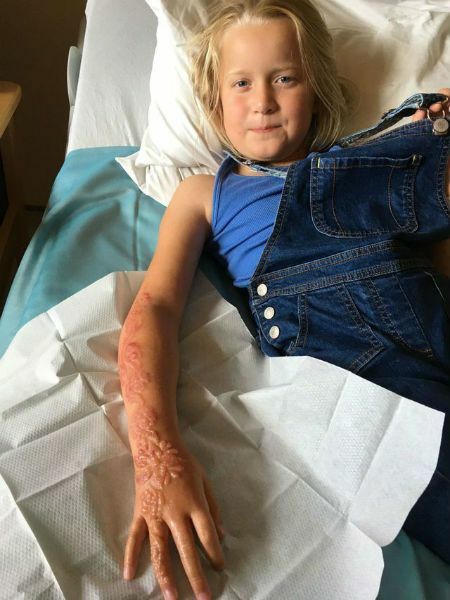 After a family vacation that was meant to be relaxing and fun was marred by stressful, scary event, the Gulliver family is sending out cautionary words to parents about the potential danger of certain kinds of henna tattoos. Martin and Sylvia Gulliver thought that their sunny vacation to Egypt with their two children, Sebastian, aged nine and Madison, aged seven, would be nothing but excitement and adventure. Then, it took a bad turn when Sylvia developed a gallbladder issue and had to head to the hospital. 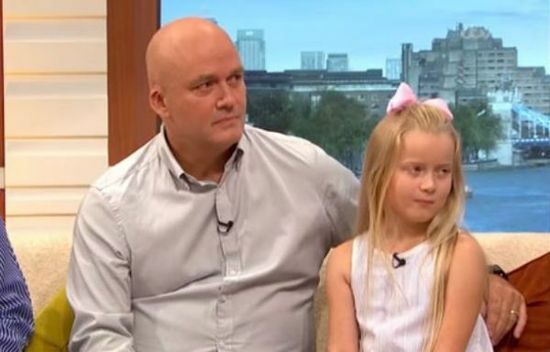 Sylvia recovered fine, and the two parents were so proud of their kids for being well-behaved when they had to spend two days in the hospital with their mom that they thought it was the perfect time for a reward. 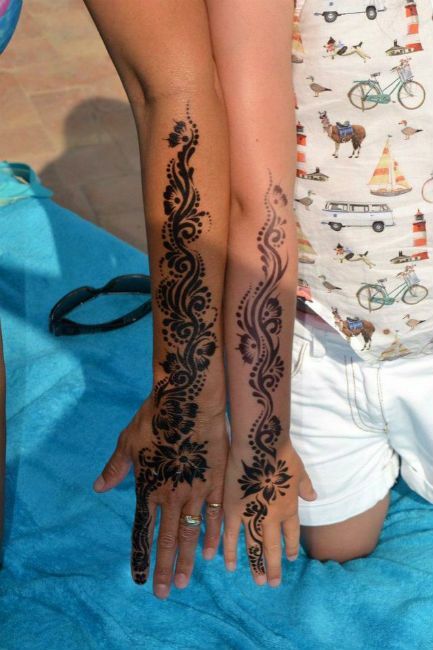 They headed to a salon and let the kids get some cool-looking temporary henna tattoos – a popular stylish statement that loads of kids enjoy. Everything seemed fine at first, but the next day Madison’s arm under the tattoo was getting itchy. As there was no visible redness, her parents thought she would be fine, but the next day the whole patch of skin felt very itchy to Madison. 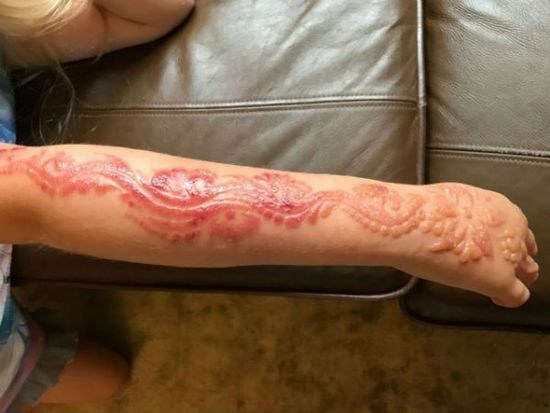 They decided to help wash off the tattoo in hopes that would make things better, but instead what they found was a huge rash underneath in the outline of the tattoo’s design. The Gullivers tried a few standard rash remedies but the rash only continued to get worse. 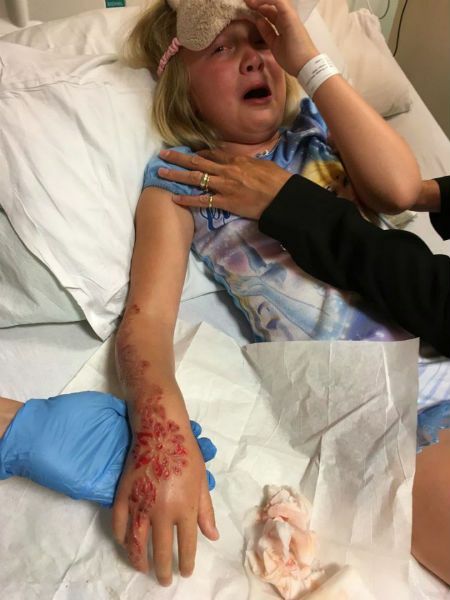 Little did they know that what Madison was experiencing was sadly a common and very serious problem caused by the dyes used in black henna tattoos, which contain a chemical called para-phenylenediamine (PPD) that gives it that inky black shade. PPD is present in many kinds of cosmetics and hair dyes and is the cause of many strong allergic reactions in kids. 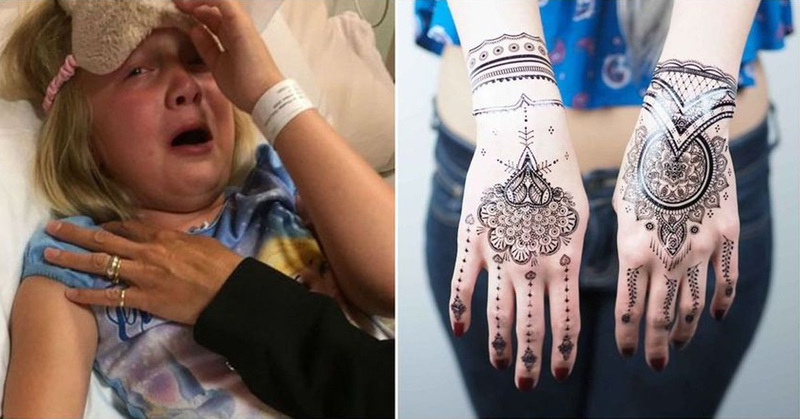 They can cause severe burns and have such a huge risk attached to them that the Food and Drug Administration (FDA) has issued warnings about black henna tattoos in the past. Do note that brown or red henna tattoos, the more traditional kind, are perfectly safe for children. 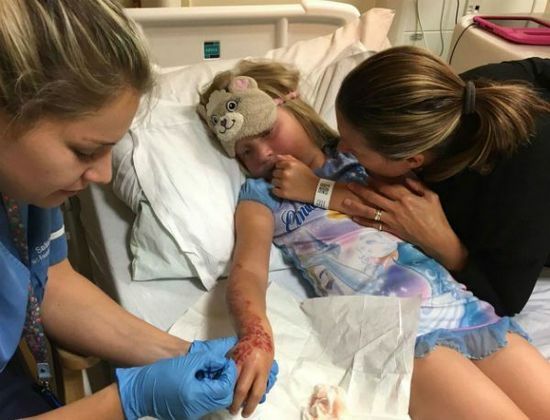 When the Gullivers finished their vacation and got back home, the rash on Madison’s arm had begun to blister and they had to bring her to the hospital. A number of ointments and creams and some confused medical professionals later, she had to be referred to a doctor who specializes in burns. Needless to say, both Martin and Sylvia were panicked. Thankfully, this time Madison began to get the care she needed. She had chemicals burns on her arm and it had to be specially treated. It was incredibly painful as the top layer of her blister had to be cut off in order for the burn to be treated as needed. She’s recovering from the ordeal now, but there’s a chance the scars will last for a lifetime. She’s also developed an allergy to penicillin, as PPD can result in sensitivity towards anesthetic drugs and medications. Now that the Gullivers know about the dangers of black henna tattoos, they’re making it their mission the spread the word to other parents. Meanwhile, the salon has apologized for using their products on a child and are no longer offering henna tattoos.